Rome - With world cycling chiefs reeling from the fall-out of the Lance Armstrong doping scandal, an unlikely mascot has been unveiled for next year's UCI World Road Race Championships in Italy - Pinocchio. The International Cycling Union (UCI) have come under increasing scrutiny over their handling of the Armstrong affair, and the choice of the wooden, fictional character whose nose grows when he lies could be seen as highly unfortunate. "Ours is a Pinocchio connected to his origins, happy, athletic and attentive," organisers said on the official toscana2013.it website. "He is looking at the horizon, expressing an optimistic attitude versus the future. The expression of his face is smiling, happy, positive and at the same time astonished." 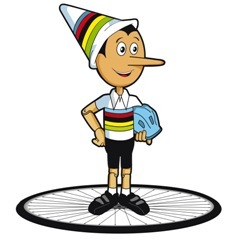 They added: "Our Pinocchio is happy that his land, Tuscany, has been chosen to host the World Championships of Cycling. The outline is athletic and slim like a real rider."